OK, I admit it. I’ve laughed at all these sensor web applications that I’ve seen over the years. Really who is going to be able to bring this to the general public (at least that public using Google Mobile apps not on the iPhone). Google of course! What if you could do a little something to improve the world during your daily drive to work Here are a few ideas: tell everybody in the city when you’re stuck in slow-moving traffic; warn the drivers on the freeway behind you that they should consider an alternate route; tell the people still at home that they should spend another ten minutes reading the morning news before they leave for work; tell your city government that they might want to change the timing of that traffic light at the highway on-ramp. Of course, you can’t just get on the phone and call everybody, and your one traffic report from your one spot on the road might not help much anyway. But if everybody on the road, all at once, could tell the world how fast their car is moving, and we could make it easy for anybody to check that information on their computer or cell phone, well ‘ then we’d be getting somewhere. Of course I don’t always have open Google Maps when I’m rolling around Phoenix, but I’m sure many people do. Lack of iPhone support isn’t surprising, but I’m sure it will be in the works soon. It took a company with large resources like Google to pull this off, but I can’t help but gaze to the sky to just think about all the sensor web applications out there that are just around the corner. Maybe Goodchild was right after all, VGI is a huge promise that may get fulfilled really soon. I can’t help but think about my post from yesterday though. Just really great data being collected by Google, but locked up in their API. Maybe if we had our act together, there would have been a viable open sensor web that companies such as Google, Verizon, AT&T, Microsoft, Oracle, etc could have joined and we’d be able to share data between platforms. Taking part in Google’s transit project will only continue to reinforce their dominance over content. I’m torn, but still excited. 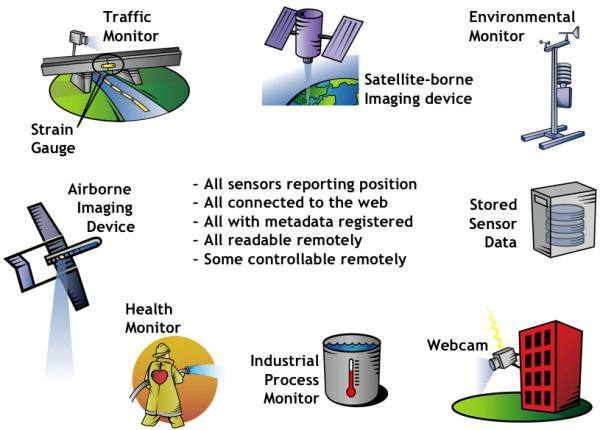 Looking at OGC’s sensor web graphic you have to wonder how much of this will actually come true. Clearly not all sensor webs will be open and usable outside of the platform they are intended.